When you make some business investments, it’s easy to see what your return will be. If you buy X to resell, you know what your margins are. You know what your ROI will be. But when it comes to SEO web design, often business leaders find it harder to see why it’s important. The benefits seem intangible. It seems like a lot of work. Is it really worth it? You have some healthy skepticism. But here’s why a business that wants to grow can’t afford to ignore SEO web design. Let’s explore the numbers that prove how important it is to business success. You may be in ecommerce. Or maybe you’re a professional blogger or a small local business. It doesn’t matter. Website traffic is important for business success for every business in today’s age of the Internet. SEO web design helps you rank in search engines. That means you’re more visible when your potential customers are looking for something that you offer. A website accomplishes this by being as responsive as possible. Why? Because it matters to your customers. And when you focus on what matters to your customers, you attract more customers. You increase revenues and pad your profits. Speed is a major factor in website responsiveness. Seconds matter in SEO web design. An expert designer knows that for every additional second it takes a page to load you lose potential visitors. These visitors are people who click on your ads or links on other sites to visit your site. You could even be paying for this traffic. At just 2 seconds, you’ve lost around 12% of the people who clicked to visit your website. Get up to 4 seconds. You’ve lost 25% of your potential visitors. Does your site take longer? You’re losing almost half of your traffic. What would your sales look like if you suddenly doubled your traffic? Less than 1/2 of people are willing to wait over 6 seconds. In effect, you can double traffic simply by speeding up your website. Keep the traffic that you attract. Don’t pay for ad clicks only to have people leave the site. Do so with website SEO. Responsiveness is about more than speed. We’ll explore other forms of responsiveness throughout the article. Getting traffic is one thing. But are these potential customers? SEO website design helps your business attract people who are very likely to become paying customers and share your brand with others. They do this by incorporating design features, widgets, style elements, imagery and text that appeal specifically to your target. This requires extensive research, testing and know-how. Many of these features you won’t find on cookie-cutter, build-your-own website platforms. That’s why it’s best to work with a professional when building or modify your website. Who your target really is. Really hash this out and get clear about it with customer personas. It also determines what you do on an ongoing basis to maintain your website’s traction, rankings and place in the lives of customers. You do this with ongoing SEO maintenance. A site that’s not maintained on a weekly, monthly and sometimes even daily basis will get stale. It will begin to decline as new, better websites overtake it. Have you ever been on a website that looked one way? Then you click on something. It feels like your on a different site. The design looks old and different. The colors and fonts are different. Or maybe it has features that seem dated and just plain annoying. Navigation is weird and seems disorganized. You may even have trouble getting back to the other part of the site. A site like this may have applied some SEO elements. But it’s not optimized. Distracted visitors don’t waste their time trying to work around ineffective navigation or inconsistent design. They abandon their carts or other ambitions for this visit. Proper SEO web design offers a seamless experience for your potential customers. Every millimeter of the site on any device is consistent and user-friendly. It leaves nothing to chance. It never accepts “good enough”. It only accepts the best because that’s what optimization is. It gently yet intentionally guides a visitor through content, features, pricing and where ever you want a person to go. There are no distractions. They can easily find what they want. It’s impossible to lose their place. An SEO web design is the heart of your online presence that amplifies the effectiveness of everything you do online. Attracting people to your site who are potential customers is important. But you have to be able to “close the sale” with them. SEO web design is also conversion rate optimized (CRO). It helps you do something with all of this high-quality traffic you’re getting. SEO website design should seamlessly guide a person through the site. It makes taking a desired action like scheduling an appointment or buying something a no-brainer. They may not buy anything this first-go-round. In fact, on average it takes 7-13 touch points for someone to become a paying customer. But these micro-conversions help ensure that this visit was not wasted. An SEO expert watches these micro-conversions. They learn from them to further optimize the user experience. If people are getting hung up on a certain site elements, you see it by how people are completing these micro-conversions. On top of that, search engines like Google “track” these little interactions. If someone is clicking on things and staying on the site, they consider this a positive user experience. Website SEO must demonstrate that a website offers a great customer experience to earn top spots in search results. That leads us to our next point. The organic search results are the search results in Google that are not paid ads. It drives over 50% of traffic around the web. Most people prefer to click on an organic result. Being at the top of the results demonstrates social proof that your site is the best site to answer that query. Over 75% of this traffic goes to people who are on the 1st page of the search results. Search engines like Google are continually improving their algorithms to make sure the best sites float to the top. This increased visibility is what offers many of the SEO benefits for business we’re discussing. Connects with customers at critical moments in their buyer’s journey. Cuts marketing costs over time. When you’re more visible you are in the organic search results, you need to run fewer ads to drive traffic. Delight customers. Customers see you in more places. They learn to turn to you as the expert in your industry. Maintain your SEO web design and these benefits will continue to compound, making you even more visible. 44% of people will warn at least 1 friend about a bad website experience. 79% won’t return to the website. Nearly 80% of people check reviews before buying from a business. A bad online reputation will cost a business 70% of your potential business. Add that to the 50% who flee your site. That’s where we play the “crickets” sound effect. This isn’t the attention you want. What do you want? SEO web design leaves people with a positive lasting impression of your brand. It makes it so easy to accomplish what they came here to do. Not only are they less likely to write bad reviews. They’re much more likely to write a positive one. 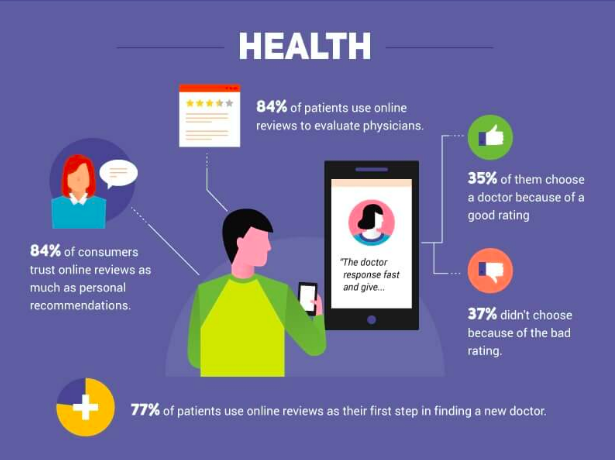 Here’s a quick snapshot of how reviews influence consumer decisions in one major industry, healthcare. In fact, further use your effective design to get more reviews. Great reviews of sites like Yelp and Google drive more traffic to your website. That’s just another way website SEO optimizes everything. Website SEO integrates everything to maximize your visibility not just in search engines but everywhere online. A website with an SEO web design makes social media sharing straight from the website easily. It includes strategically placed widgets that demonstrate your social media popularity. When people share something from your site it’s much more powerful than an ad. It becomes a personal recommendation. Social sharing doesn’t directly help you achieve those top spots in search engines. But it will build your brand awareness and increase the amount of high-quality traffic coming to your site. These will give search engine algorithms what they need to see to know that you deserve the visibility. When a business has SEO web design, other industry leaders notice. They link to and share your content. Their attention helps attract recognition and more traffic. A shout-out from someone in your industry who your potential customers know and respect has real power to increase brand awareness, traffic, and revenues. Are you running ads on Facebook, Instagram or AdWords? Where do those ads go? One of the primary reasons to run ads is to get people to your website. AdWords Advertising, for example, helps you bypass the normally ranking system to appear at the top of a search — for a price. Website SEO creates a seamless ad experience from ad to click to your website and beyond. It continues that clicker’s journey. It allows nothing to get in the way of making the most of that click. With SEO landing pages people are greeting with a clear understanding of what to do next. SEO increases your conversion rate substantially. That means your ROI on ad spend goes up significantly, reducing customer acquisition costs. Stop paying for ad clicks from people who immediately abandon your site because it doesn’t have an SEO web design. That’s a complete waste of time and money. Mobile website traffic now accounts for around 60% (the majority) of Internet traffic. If your website was optimized for desktops, you’re losing steam fast. Apple became a trillion dollar company in the summer of 2018. It sells more iPhones in 24 hours than the number of babies born worldwide in that same time frame. That’s an astonishing feat considering the price point. And that’s just one mobile company. Increasingly, your customers are visiting your site on mobile devices first. If the experience is bad, they don’t wait until they get home to hop on their laptop. For many, the smartphone is their primary computer. 50% of mobile visitors will visit a local business within 24 hours of visiting them online. A huge part of SEO web design in 2018 and beyond is optimizing this mobile experience. Mobile optimization goes beyond having a website that’s fast. It goes beyond having a site who’s text and images adjust for enhanced mobile. All of that is important. But mobile SEO is more. A mobile-optimized website is completely customized for your business. It allows customers to interact with your brand while they’re in the store or 1,000 miles away. It offers tools that completely integrate the mobile experience with the physical experience. SEO web design is a long-term investment that keeps paying you back as long as you maintain it. With minimal monthly maintenance you typically not only maintain your current position in searches. You see a snowball effect as the returns begin to multiply. Here’s how those returns typically play out. In the first 3 months after you invest in website SEO, you’ll notice a change in how people interact with your website. They’re staying on your website longer. They’re clicking through to other pages. If you’ve optimized for conversions, your conversion rates go way up. You’re also getting more out of social media and search advertising. Before, you were attracting a lot of visitors that didn’t actually become customers. Now, when people arrive through these channels, you can actually see a measurable and sustainable return on your marketing budget. At this point, you’re not yet seeing traffic coming in through organic search results. But as you continue to drive traffic through ads and referrals, Google sees how much people like your site. They watch and wait. They want to make sure you’re consistent. Can you keep up the momentum? By this point, your website is built and you’re regularly adding new content like blogs, videos, visuals, tools, quizzes and other content that your target audience appreciates. You’re on a schedule and demonstrating a solid track record of delighting your visitors. If you’ve done your keyword research and built content around it, you’ll begin to rank for some less competitive keywords. You’ll go from getting no organic traffic to getting some. If you’ve invested in local SEO, you’ll find it’s easier to rank in your local area. Around this time, search engines like Google recognize your efforts and begin to reward you for doing things right. You see your website authority rising on authority estimators like Moz. As it does, it gets easier for you to compete for more competitive search queries. Now, you’re really starting to see the fruits of your labor. Unless you have a very seasonal business, you’ll see organic traffic increase month over month. You may be envisioning endless growth. And you can obtain it. But competitors will take note and begin challenging you for those top spots. They’ll look at what you’re doing so well and try to mimic it or do it better. Unless they’re neck and neck with you, it will be hard for them to challenge your throne. But if you’re not paying attention, it’s very possible. They may even engage in negative SEO. Negative SEO is a black hat SEO technique. Unscrupulous SEO experts take what they know about SEO. They then do things to your website that can get your site penalized by Google. For example, Google devalues a site that has a lot of links from spammy websites. Someone using these techniques could create a bunch of spammy links to your site. A savvy SEO professional is always watching the analytics to identify how the actions of the competition are impacting your site. Never take part in black hat SEO. Working with a professional that uses white hat SEO tactics is the only way to go. At 12+ months, a site typically goes into monthly maintenance mode. They continue to publish new content, update the website and adapt to changes in the competitive landscape. As they so, traffic continues to increase. Conversions get even easier. The business grows. We discussed specifically how important website SEO is to your ad campaigns and online reputation. But let’s take a moment to bring this all together. Let’s look at marketing as a whole. You spend money through AdWords, Facebook or another ad platform to get traffic. You may be spending hours every week posting things on social media, trying to drive “free traffic”. If you’re not getting organic traffic, most of your traffic comes from these sources. These take a lot of time and money to manage. They take a lot more if you don’t have the automation and analytical tools that digital marketing companies have to streamline management. While this may be necessary to get initial traffic, relying solely on paid advertising and social media to drive traffic is costly. Spending 75% to 90% of your customers’ initial purchases to acquire them isn’t a sustainable, long-term business strategy. If you stopped advertising or abandon your social media profile, the traffic would completely stop. There’s little long-term pay-off. Website SEO pays you back over the long-term with monthly maintenance. It doesn’t eliminate the other. They continue to work hand in hand, delivering growth and profits. But as more traffic comes in organically, you rely less on these more costly traffic-generation methods. You’re getting more with less. That’s how your marketing ROI should be. How Do I Get an SEO Web Design? You’ll hear a lot of businesses asking the same questions. How can I get my site to #1 on Google? Will SEO help me get more traffic? They’ve usually created a free site using some easy templates on Wix, Joomla, or WordPress. Then they find out how hard it is for a new website to be found. Or, in some cases, they’ve had the website for 10 years. The importance of website traffic is becoming clearer every day. They’ve finally decided to do something about their low numbers. You can do a lot to improve a website after it’s been built. You can increase the traffic. But you can’t fully SEO an existing site. SEO stands for search engine optimization. “Optimization” is an all or nothing proposition. You can’t say something is “optimized” unless it’s fully optimized. And if you’re not optimized you’re not getting the results you could be for your business. You can decorate a brick with cake frosting. It looks good on the outside. It tastes good at first. But once you get below the surface, you realize it’s a brick. There’s not much you can do with it at that point. It’s not a cake. If you’re really serious about maximizing your search engine exposure, SEO web design is how to get it done. Content management systems do their very best to be SEO-friendly. But they must be everything to everyone. Websites that incorporate SEO web design gets results and deliver the best ROI. They are built around your business, customers, industry, and goals. Customers and Google respect them as leaders in your industry. Website SEO is more than just publishing some content. It’s more than creating a site that’s fast and easy to navigate. SEO is optimization. That means maximum efficiency for everything you do. More traffic. Better traffic. Increase conversions. People spending more. You making more money. To learn more about how we can help you get these measurable benefits of SEO, contact us for a free consultation.